Our growing awareness of this call is closely related to the Museum on the Seam, several blocks up the street from us. Fifty years ago, it was the location of the Mandelbaum Gate, which was the border crossing between the two Jerusalems of that time. We live on the edge of what was then “No-man’s Land”: how many formerly Arab homes we see along our street, yet surrounding our apartment are the Mea Shearim and Shivetai Israel ultra-orthodox Jewish communities and many little synagogues. Now, as we anticipate the establishment of the Palestinian State alongside the Jewish State of Israel, and a new configuration of Jerusalem as the capital of both, what wisdom can “living on the seam” offer our “Project for Life” for this new moment in the Congregation? “Living on the seam” holds two realities together passionately and compassionately, the Palestinian with all the variety that it embraces and the Israeli with its own inclusive trends. The “sounds of silence” on Shabbat and the muezzin’s call five times a day have special resonance at Beit Ruth, located just a seven-minute walk outside the Damascus Gate. The echoes and insights of the celebrations of the Jewish feasts in our neighbourhood remain a source of inspiration and enrichment. Very frequently Diane crosses from one setting to the other for meetings or celebrations, or appointments, or for work with Vicky Tutundjian, the Palestinian Accountant of the Mediterranean Province / Network. Her commitment as a member of the Board of Directors of Ecce Homo and of the Visioning Board of Ein Karem is also a means to service of and sensitivity to both contexts. As Coordinator of the English Section of the Union of Religious, she seeks to strengthen the bonds among the sisters of many different congregations on both sides of the check-points. For Regine and Rose Theresa, the bonds of friendship extend in both directions: how often Rose Theresa or Regine receives visits from one or other Palestinian woman (Muslim or Christian), long-time acquaintances, who come to Beit Ruth simply in friendship or for assistance for themselves or their families. On the Jewish feasts Rose Theresa is invited to the homes of friends, and Regine usually to her sister’s family in Tel Aviv. The gifts of language are indispensable and Rose Theresa and Regine both converse in six! Rose Theresa’s commitments in teaching English and Regine’s many trips to the Ministry of the Interior for visas for the students of the Center for Biblical Formation also serve the commitment to build bonds and bridges. Regine’s attention to Amha, an association of Shoah Survivors, and to events at Yad Vashem offers another element to our awareness of the reality here. Diane’s usual choice of liturgical setting is the Ecole Biblique (Dominicans), while Rose Theresa’s is Notre Dame Centre (Legionaires and Regnum Christi), and Regine’s is the Kehillah (the Hebrew-speaking community in Jerusalem); these also expand our horizons and touch some of the many gifts and needs of the Church here as it seeks its way forward in the light of the 2010 Synod for the Middle East. 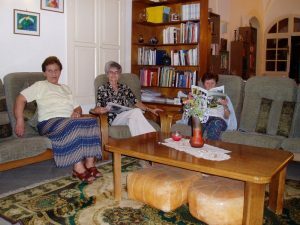 Beit Ruth provides, for all of the Sisters and Brothers of Sion in the Jerusalem area, a place to meet outside the institutions, for reflection, prayer, and social time together. In this spirit of living on the seam, we continue on the journey that has brought us to this point.